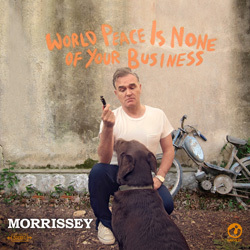 This is a one-track MP3 download ahead of Morrissey's 2014 album "World Peace Is None Of Your Business". The single was not released in physical format otherwise than as a b-side on the "World Peace Is None Of Your Business" 10" single. The song was also given away to people who pre-ordered the deluxe edition of the latter album from iTunes. No specific artwork was created for this second song made available ahead of the release of the "World Peace Is None Of Your Business" album. The artwork displayed here is that of the "World Peace Is None Of Your Business" single which is the one used by the main digital retailers (Amazon, iTunes) at the time of release. UK: The digital releases of this single as well as the upcoming "World Peace Is None Of Your Business" album were promoted with the help of a one-track cd distributed inside a soft PVC sleeve with a colour insert showing the usual artwork. An artist information sticker is found on the back of the PVC sleeve. France: The releases of the upcoming "World Peace Is None Of Your Business" album and probably this digital single as well were promoted with the help of a one-track cd sent around inside a soft PVC sleeve with a colour insert showing the usual artwork.